On Being The Very Best Like No One Ever Was. When I say I was into Pokémon, I mean I was into Pokémon. I was sucked in the first time I read about it in Nintendo Power. This isn’t specifically about the game, which is/was/will remain fantastic. This is about the trading card game. I was already wrapped up in the world of Pokémon when I heard about it. I may or may not (totally did) have a Pokémon binder among various other paraphernalia. I’m not totally sure how I caught wind of it, but I heard a couple of my friends were in an after school Pokémon card league on Fridays. Well, I liked Fridays, I liked after school, and I sure as hell like Pokémon. I didn’t know a thing about trading card games, but that wasn’t going to stop me. I convinced/whined and complained to my parents to purchase me a starter deck and promptly signed up for the league. Luckily, those guys mentored me in the game and the atmosphere was welcome and inviting. For one glorious half-year (10/30/99-04/09/2000) Friday’s meant one thing. League 3-7 PM. It also meant Totino’s party pizzas, but while league is a thing of the past, party pizzas can still, and should happen. It hard to explain how fun it was, but it was something I greatly looked forward to at the end of each week. It was fiercely competitive, but everyone was surprisingly nice for a group of mostly boys aged 9-12. We just all loved the game and loved playing it. We kept scores and reported all matches so we had point totals and checked the website religiously to see our rankings. Sadly, due to the card shop closing the website is also a thing of the past. Luckily, the wonderful Way Back Machine archived the site. I have now mirrored the sites, as they were when I saw them, on my own site. We were intense. The shop owner imported the yet to be released Japanese card packs and sold them to us for a hefty profit. I shutter to think how much money I sank into those cards. Because they were in Japanese we had translation guides found in the once great, SCRYE. We went so far as to have to have blacked out card back protectors when using the Japanese cards because the designs on the back of the Japanese cards were different from the American version and people could cheat if not blocked. 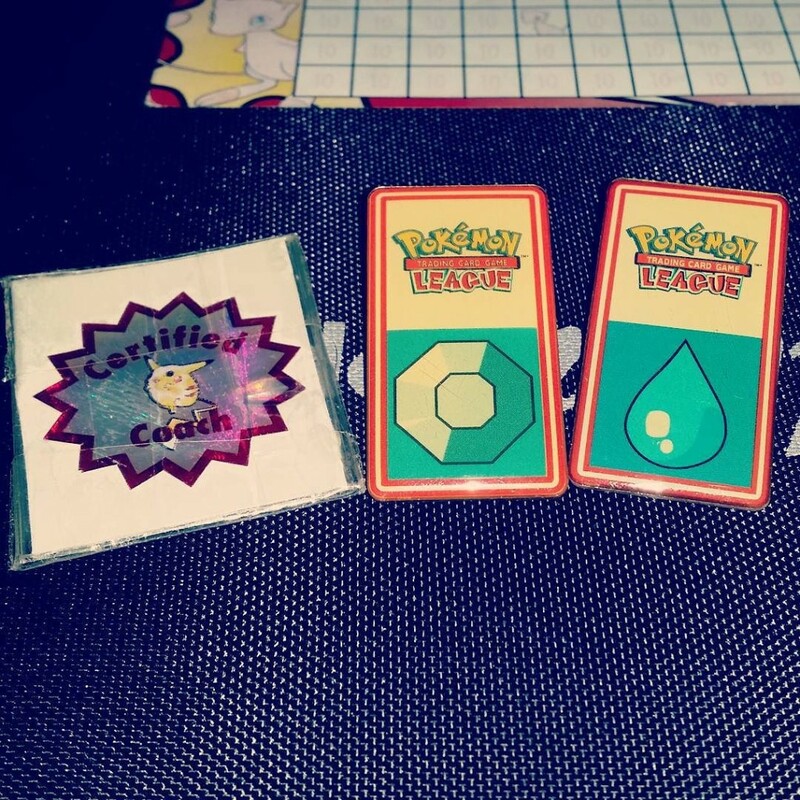 I became a “Gym Leader” in the 4th season of the league. This basically meant I could be a deciding voice in match disputes. I also was in charge of official scoring and mentoring. It was super fun! We all developed strategies and analyzed weaknesses and spent hours building, tearing apart, and rebuilding decks. This culminated in a tournament held at Southlake Mall in Merrillville, IN. It was an official Wizards of the Coast tournament, and this was the peak of Pokémania. It was massive with hundreds of kids and some teenagers playing. Because we played all the time against each other we were pretty confident in our abilities. One of my friends was like a savant. I almost never beat him. I managed to walk away with three victories, but lost early on. He made it to the final round. It was actually two Big League players who faced off for the championship. He ultimately lost, but it was clear we were the best players in the area. Which was brag worthy back then, but maybe (definitely) no so much now. Like all good things that burn too brightly, it was done almost as soon as it started. When 2000 came around we were all started to become angsty teenagers who were more into girls than card games. That meant, sadly, Pokémon league was out the window. And so it went, but I can look back on it fondly as an amazingly fun was to spend a Friday night. I still have my decks, so maybe some Friday night the special, three move, Japanese, Team Rocket Mewtwo will make an appearance.